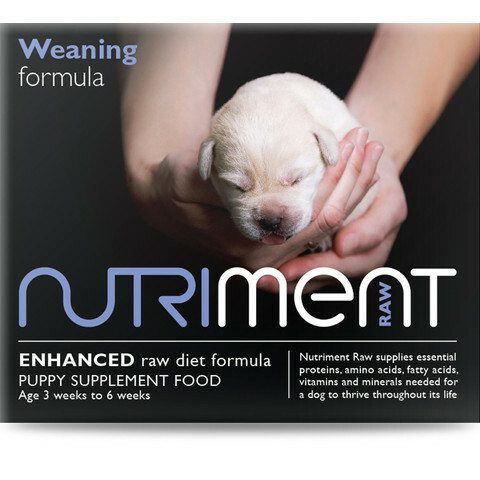 The Nutriment Weaning Formula RAW Frozen Puppy Food is available in a 500g tub. Nutriment RAW Frozen Weaning Formula provides essential proteins, amino acids, fatty acids, vitamins and minerals need for your dog to thrive throughout its life. Nutriment RAW Frozen Weaning Formula is made with 1000% British chicken and bone. Made with just one ingredient; chicken carcasses. Just as in babies you want to introduce plain and simple foods first. It is grounds to a paste that will have fine bits of bone easy for them to digest. The weaning paste is only intended as a supplement to the mother’s milk. Puppies should be allowed to suckle first then offer the weaning paste.